I have been in water storage construction for over 15 years. I also come from a rural background. On the land and now in the towns water is becoming a very precious resource. 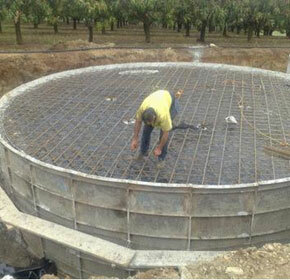 Advance Concrete Tanks treat the construction of water storage with that in mind. For the past two decades Australians have depended on concrete water tanks more than any other type, to store and protect their most valuable resource. Water stored in an enclosed concrete tank is always cool, clear and algae free, and concrete tanks clearly outlast the rest. A concrete tank won't blow away in a storm, can withstand (even help fight) rural Australia's most feared enemy, fire. Most importantly, concrete is a natural product and an ideal medium for drinking water storage. It won't deteriorate or breakdown even in the harshest weather conditions Australia can offer and there is no danger of loose, perhaps invisible fibres contaminating your drinking water. Drinking water stored in an Advance Concrete Tank is safe.You won't believe the great taste of pure rain water! Aware customers view security, quality and service as being the most important considerations.The application and uses of concrete water storage tanks are almost endless.In ground water tanks can be used in industrial and commercial areas well as the landowners. Above ground water tanks are the traditional tank for the man on the land, Gravity feed to stock troughs, house and gardens etc.Under ground water tanks can be used for wine cellar, or where a Gazebo or Pergola is required on top. Also for industrial areas, under car parks or where area is restricted. Concrete tanks are durable can withstand storms floods an earth quakes, they are an excellent substitute for plastic or corrugated iron tanks in high fire risk areas, due to there ability to withstand heat, concrete tanks wont rust they keep rain water cool and fresh. Underground concrete water tanks can be completely buried eliminating fire damage and allowing more space on the block. All tanks are engineered designed for individual requirements, all concrete tanks are designed above Australian standards by certified engineers.We have been building concrete water tanks for over 15 years, you can be assured of a quality product built and over seared by the owner not sub standard contractors. Advance Concrete Tanks installation of a concrete tank and roof slab in Sydney's Cecil Park. 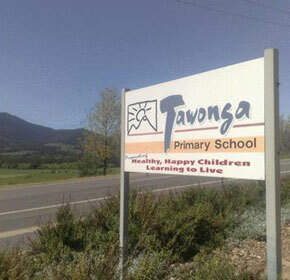 Concrete Water Tank Builders Australia created an inground concrete tank for Tawonga school.